The classic martini is back in a big way, and top bartenders are returning it to its rightful place in the cocktail canon. Gone are the days of neon-colored, Jolly Rancher-flavored apple-tinis (sorry, sugar fiends). The classic martini is back in a big way, and top bartenders are returning it to its rightful place in the cocktail canon. Here are some of our favorite martinis to try at home. If it ain’t broke, don’t fix it. This martini is a classic for a reason. Combine the gin and vermouth in a chilled mixing glass over ice. Stir well with a cocktail spoon, then strain into a chilled martini glass. Quickly fold the lemon peel over the drink to express the oils. Garnish with the peel. California kiwis are available from October through May, so now’s the time to enjoy this seasonal, fresh cocktail. It’s the perfect reminder that winter has an end, even if it doesn’t seem that way. Muddle kiwi in a cocktail shaker filled with ice. Add apple syrup, vodka and lychee juice. Shake well. Pour into a chilled martini glass. Muddle the mint, 1 cucumber slice and syrup in a shaker. Add ice, Bourbon and water, and shake. Strain into a chilled martini glass. Garnish with the remaining cucumber slice. This recipe for the Vesper Martini was created from the pages of Ian Fleming’s classic James Bond 1953 thriller, Casino Royale. Add all ingredients except garnish into a cocktail shaker with ice. Shake until ice-cold. Garnish with a large, thin slice of lemon peel. Invented during Prohibition to mask the flavors of low-quality bathtub gin, the Bee’s Knees, which employs honey’s sweet, earthy notes, quickly became a classic. The addition of orange juice lifts the drink with a fuller citrus kiss. Fill a cocktail shaker ⅔ filled with ice and add all ingredients, except garnish. Shake for approximately 15 seconds, and strain into a chilled cocktail glass. Garnish with the orange slice. Hop on the bitter bandwagon with this tipple, which uses sweetly herbal Campari with bright grapefruit juice. Pour all ingredients into a shaker ⅔ filled with ice. Shake well, and strain into a very large, chilled cocktail glass. Enjoy a drink with Academy Award-winning actor, Robert De Niro. (Well, sort of.) 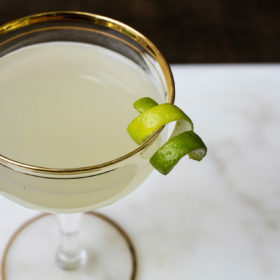 Mix up his take on the classic martini with this boozy upgrade. Combine vodka and vermouth in a cocktail shaker over ice. Stir well, and strain into a martini glass. Pour back into the shaker, and strain again into the glass. Garnish with the lemon twist.